Sander Steenbeek from the Van Rheenen group, a former research group of the Hubrecht Institute currently located at the Netherlands Cancer Institute (NKI), successfully defended his thesis on the 15th of January. During his PhD, Steenbeek studied communication of cancer cells via extracellular vesicles. Tumors are heterogeneous, they consist of cells with different characteristics. These different cells can communicate with each other through direct cell-cell contacts and soluble molecules, but also via small extracellular vesicles that contain a ‘message’ for another cell. This message consists of a variety of molecules, including proteins, RNA and DNA. Through this communication, cancer cells can benefit from each other’s characteristics; some studies suggest that cancer cells can be protected from cancer treatment by other, more resistant cancer cells, and others suggest that heterogeneous tumors can grow and metastasize faster because the cells within the tumor can instruct each other. It is difficult to study this communication between cancer cells in vivo, because it is hard to know which cancer cells release extracellular vesicles and which cells take up these vesicles. In addition, it is difficult to investigate what the uptake of such a vesicle is doing in the recipient cell. The Van Rheenen group developed an in vivo model system to study extracellular vesicle communication between cancer cells. Using this model, the transfer of extracellular vesicles between two populations of cells can be studied using the Cre-LoxP system. The releasing cell population expresses Cre, while receiving cell population contains a Cre-LoxP reporter. Reporter cells express a red fluorescent protein, until they receive Cre from the Cre expressing cell population via an extracellular vesicle, upon which they stop expressing the red fluorescent protein and start expressing a green fluorescent protein. This visualizes which cells have taken up an extracellular vesicle derived from the Cre expressing cells. Using the intravital imaging technique, optimized by the Van Rheenen lab, these cells can be visualized and tracked over time in vivo, which enables the investigation of cell behavior after uptake of extracellular vesicles. 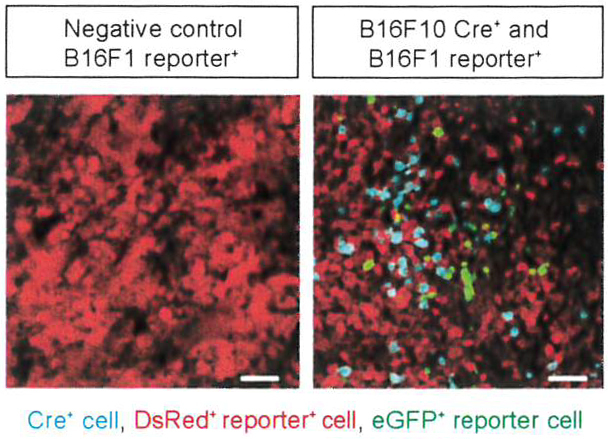 Using this Cre-LoxP reporter system to study extracellular vesicle communication, Steenbeek and colleagues found that cancer cells from distinct clones phenocopy their behavior after the uptake of extracellular vesicles. They also studied the message contained in these extracellular vesicles through mass spectrometry and RNA sequencing and found that they can contain thousands of different proteins and RNAs. Interestingly, many of these molecules are players in interconnected signaling networks that are involved in cellular processes such as migration. These molecules can elicit a response in the receiving cells, changing their behavior. Some cells in a tumor have stem cell characteristics and often express the oncogene RASSF1C. These cells are more aggressive, migratory and invasive than other cells. Steenbeek and colleagues show that RASSF1C expression in these cells activates the RhoA/ROCK signal transduction pathway, which induces stem cell behaviors. They have also found that these cells release more extracellular vesicles that in turn promote migration and metastasis in recipient cells, spreading and increasing the metastasizing capacity of a tumor. Jacco van Rheenen is a former group leader of the Hubrecht Institute and current group leader at the Netherlands Cancer Institute (NKI) in Amsterdam. 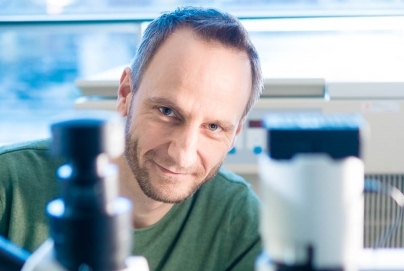 Van Rheenen is Professor of Intravital Microscopy at Utrecht University and Oncode Investigator.